This power tool has a ball-bearing construction that&apos;s sturdy yet lightweight. It comes equipped with a 1/4 inch collet, a rear exhaust and a lock-off throttle. 90 degree angle head allows flexibility in confined areas. A contoured grip offers greater comfort while you&apos;re working. Compact and lightweight, Rear exhaust air flow system directs air away from work surface. Angle Die Grinder is ideal for weld grinding, deburring, surface prep and polishing. An ergonomic grip makes for comfortable use and provides exceptional torque accuracy. Near the top of the tool is a grease fitting hole into which you can easily and conveniently feed lubricants, it can increased angle gear life. The 90 degree angled shape and superior control and maneuverability make it especially well-suited for confined and hard-to-reach places. Excellent for high speed blending, smoothing, porting and deburring in confined areas. With 20000 RPM, it&apos;s powerful enough to tackle those difficult jobs. Durable and lightweight die cast aluminum body. Low vibration, it can be a long operation. Easy-to-use, integral lock-off throttle lever prevents accidental start-up. 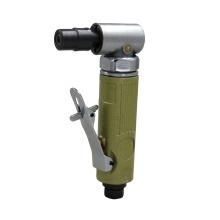 1/4" Collets, It offers rear air exhaust to direct away from the tool.